A great read for any middle grade kid who likes sports. 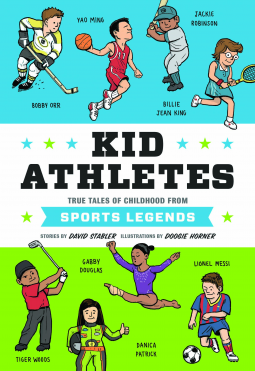 I loved the premise of this book – that amazing athletes who children idolize are real people too. As a parent, especially as my son is succeeding and failing at different activities, it’s a great perspective for him to have: That professional athletes are people who have won and lost throughout life. For my fourth-grader who is a Denver Broncos fan, he loved reading about Peyton Manning dancing the tango in front of his middle school. Other athletes included were Jackie Robinson, Yao Mind, Lionel Messi, Gabby Douglas, Tiger Woods and Danica Patrick. This is a fabulous read for middle grade kids who have an interest in sports – and covers a variety of sports, backgrounds and diversity with short stories and illustrations that make this especially good for middle grade readers.